When their son was given the diagnosis of autism, Krista and Dave Mason began to contemplate goals for his long term care. . They soon realized there wasn’t a place for adults with autism or other developmental differences. In 2007, they founded Benjamin’s Hope with a vision for a community that empowered individuals like Ben to live, work, worship and play. Today, 26 adults live, work, play, and worship on the 40-acre site. 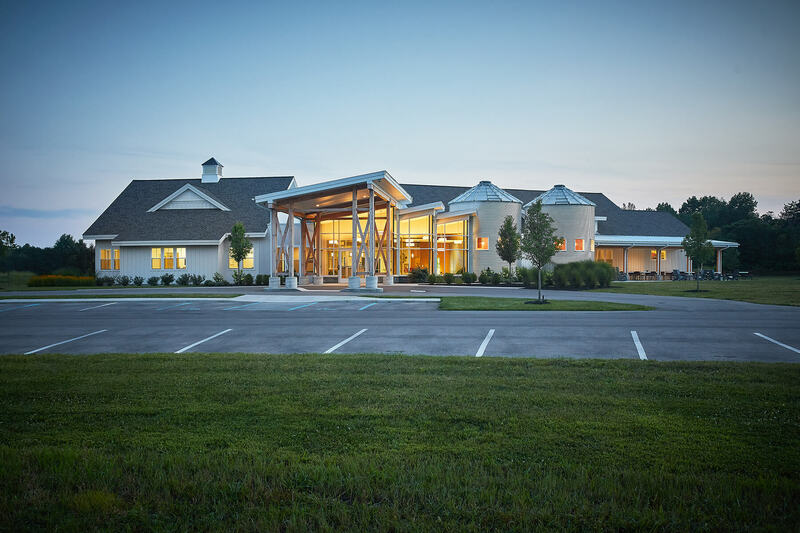 Early on, Benjamin’s Hope turned to AMDG to design a worship center and offices for residents, their families, and the neighboring Holland community. Benjamin’s Hope holds Sunday evening worship services, known as The Gathering. While considering a permanent worship space, the Mason’s envisioned a bright, light-filled setting welcoming to all. 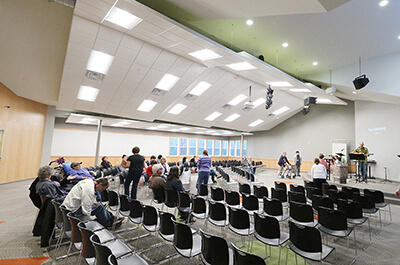 Artfully staggered acoustic tiles play an important role in an environment that celebrates external expressions of worship, including traditional and nontraditional sounds. The surrounding landscape inspired the agrarian-themed worship space. 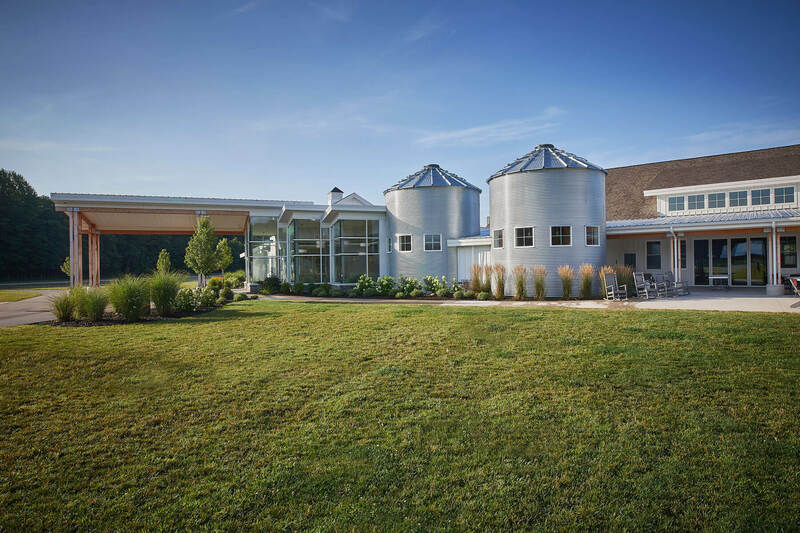 The use of actual silos, not originally intended for indoor use, required creative solutions for weatherproofing and energy efficiency. Integrated with the building, yet at the center of campus, administrative offices serve the entire Benjamin’s Hope community. The vision for a worship center and gathering space trace back to early conversations, when Krista sat down with our AMDG design team and began collaboratively refining her vision. Together, they sorted through images and sketched ideas. The rural character felt right for a culture that celebrates freedom, independence, and the belief that everyone has an important role. 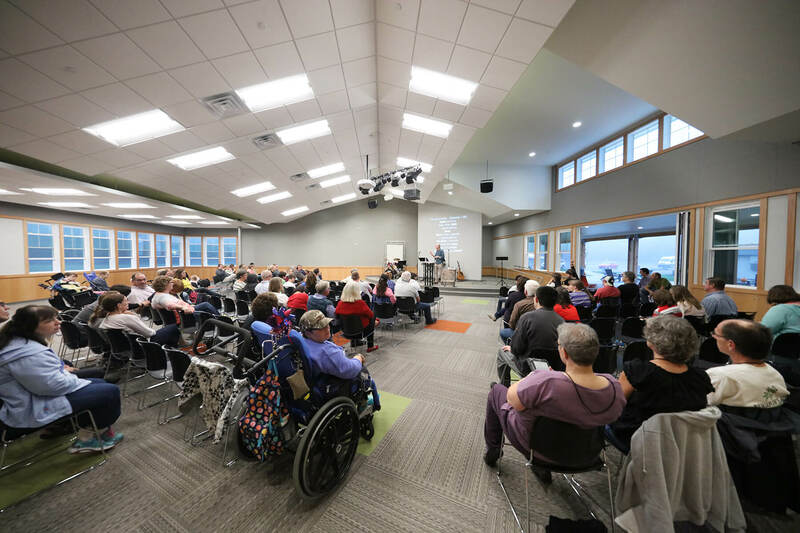 In the end, a true gathering place was developed, one that welcomes residents, guests, family and the church that is now worshiping at Benjamin’s Hope.